Sergio asked me to release this and what a great pleasure it is to do so. Monsanto Park - 1959 version. Track Length : 5.44 kms.- 3.38 mi. Ron Percival for his support trough all this project, thanks Ron!!!! John Bradley for his fantastic cover. Editor Note I : I used some mips, 3dos and srb files from other's tracks. Full credit to their authors. First race in this area was a hillclimb raced in 1910 on a section 1506 m - 0.938 mi long of Estrada de Pimenteira. Even there were more than 30000 spectators, this event was hosted only two more times, in 1913 and 1922. 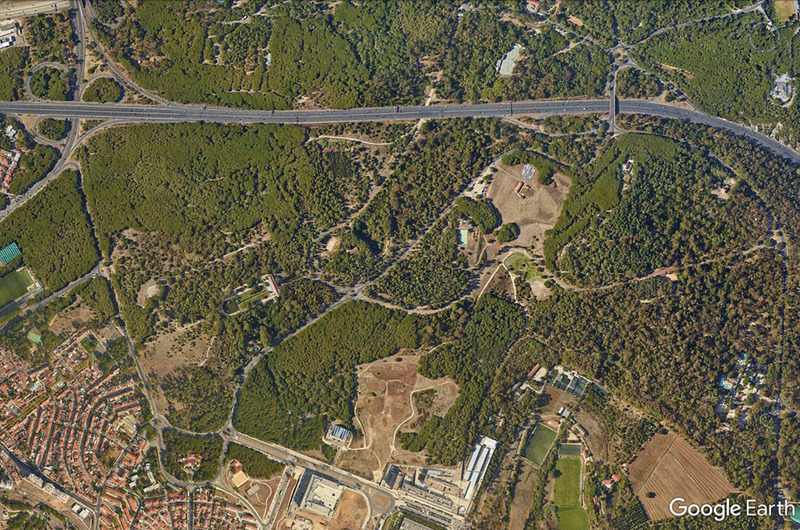 Serra de Monsanto (= Holy Hill) street track was used from 1953 to 1959 and it used also a section of Lisbon-Cascais motorway. In 1959 it was a little shortened, but I don't know what changes were made. It hosted Portugal GP in 1954, 1957 (both for Sportscar) and 1959 (F.1). It was a dangerous circuit even according to 1950s standard because it was very bumby and uneven. From 1961 to 1971 a shorter circuit was used, known as Monte Claros, because it was not possible to stop the traffic for a weekend on the motorway. In 1980 there were rumors about a remake of the track in order to host a Portugal F.1 GP in 1982. These updates are no longer needed as the current download (v101) now includes them in the dat. EDIT2: New flagger available. Get it from HERE. Awesome! Another for the ever-increasing collection. Thanks keith, thanks especially to Lord Sergio & Co.
Been looking forward to this one since Monte Claros was released. and to Keith for posting. Yet another masterpiece for GPL!! Edited by S.Beuchert, Jul 19 2006 - 06:57 AM. Thank You Sergio and all! Here is an update to the horizon, featuring the Rio Tejo at the pits hairpin. This just missed getting into the final of Sergio's beautiful recreation of the Monsanto circuit of 1959. Edited by gliebzeit, Jul 19 2006 - 03:30 PM. thanks greg!! your horizon is just great!!! 1. Thanks Sergio and team (collectively & individually) for a new addition to my Interactive Motor Sports Encyclopedia (=GPL). 2. Thanks anyone who has made anything. 3. My apologies for not making a track. I have all the tools, and have done a lot of research. I just can't get past traces & walls... I just don't comprehend. I even have some free time lately, but no excuse. Edited by Pedro, Jul 20 2006 - 12:21 PM. A splendid production, Sergio and team! Many thanks! Sergio, flagman = , many thanks. Edited by CadavreAroues, Jul 23 2006 - 04:32 PM. Track is cool. But looks like it historicly had a chicane after start straight. Edited by qwerty, Aug 30 2012 - 06:08 AM. When this track was under development this information was unavailable. Here is one of the maps and the layout of the circuit that were used back when construction was taking place. I see. In wiki even now there is no chicane. On googlemap from chicane left nothing for now. if i am not wrong there was a video, plus pictures that show that area and there was not chicane.